Matrix Parent Network & Resource Center is a nonprofit that provides free services to families of children with special needs in Marin, Napa, Sonoma, and Solano counties. Their mission is to empower families of children with special needs to successfully understand and access the systems that serve them. They offer person-to-person consultations, workshops/trainings, support groups, a resource library, information packets, help sheets, links to resources of other agencies, and more! Matrix Milers is a half marathon fundraising & training team. Many of the team members are parents of kids with special needs who devote a ton of time and energy ensuring the well-being of their special needs children that they neglect their own needs. That’s why the theme of the team is SELF-CARE. While the team members will be training hard and raising money for Matrix, Matrix will be educating them about the importance of exercise, a healthy diet, sleep, stress relief, and having fun, including wine tastings, beer socials, BBQ’s, cross-training activities and awesome prize giveaways! Matrix’s 13-week training program makes for an awesome summer, all resulting in the Santa Rosa Marathon finish line in August. 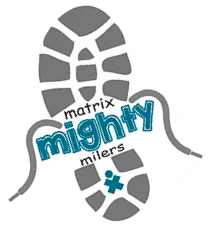 Matrix Mighty Milers is an inclusive 5K training team for children of all ages and all different abilities. While raising money for Matrix Parent Network & Resource Center, the team will train for 12 weeks and participate in the Santa Rosa Marathon 5K. Every child, regardless of their ability, need opportunities to strive for and reach their goals. Often, kids with special needs do not have the same opportunities as most children. Participating in the Matrix Mighty Milers is a fun way for all children to make a difference. We hope you’ll join the Matrix team or donate to support the crucial services they provide! Click the button below to reserve your spot today at the Santa Rosa Marathon! © Rugged Races LLC, all rights reserved.